With indoor rowing season under way, I’ve adjusted my exercise and training routine around the magic date of February 20, 2011 — the date of the 2011 C.R.A.S.H.-B sprints, aka the World Indoor Rowing Championships. Getting ready for this ugly seven minutes of agony is a long process entailing lots of time on the ergometer and weight and stretching work to protect my back. 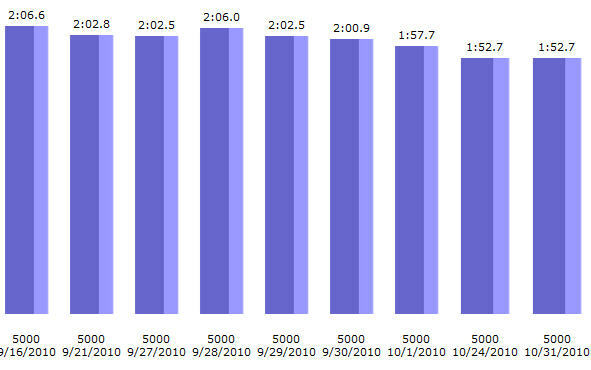 Since September I’ve been logging steady paced distance pieces: 20 to 40 minutes at a stately pace of 2:00 minutes/500 meters at 26 strokes per minutes (spm), with a shift last month to interval training designed to build endurance and lower my splits to the sprint levels I’ll need to do well in late February. I’m on a training model called the “Pete Plan” which mixes short intense interval work with long distance pieces six days a week. The Plan follows a three week cycle that repeats itself over and over — giving me an indication every 21 days of progress and improvement. Ergometer training is brutally boring – a distance piece lasting an hour can accumulate 1,500 strokes, back and forth, like a metronome, with no variation or change other than the feedback delivered by the performance monitor — the computer that indicates effort, time and distance. Following the Pete Plan provides some measure of variation — a sample workout might consist of eight short hard sprints lasting 500 meters with two minutes of rest in between. The next day might be a leisurely hour long piece. The key is a good iPod. While indoor rowing does a good job at working a varied set of muscle systems it can breed bad habits, especially in the lower back region. To compensate one has to stretch a lot and focus off the ergometer on the core. I spend a lot of time stretching hamstrings, doing situps, and evil medicine ball exercises called Russian Twists. A little weight work a few times each week, and one day of full rest to recover and then it’s on to the next week in the Pete Plan cycle. Everything is logged on the Concept 2 log book, but I’ve pimped my erg with a program called RowPro that interfaces off of my ThinkPad via a USB cable plugged into the performance monitor. I could, if I wished, compete virtually against other indoor rowers over the internet via the Oarbits server, but I use the program to build the custom interval workouts in the Pete Plan, and then upload the results into my Concept 2 log book. Diet is a big issue — I want to lose weight but not do something goofy that will leave me low on gas for the machine. Thanks to the example set by a good friend, I’ve moved pretty religiously to a “paleo” or “caveman” diet that eschews grains, legumes, dairy and sugar and focuses on lean protein (chicken, fish, eggs), carbs from vegetables (broccoli, sweet potato, cauliflower, etc.) and fats from things like olive oil, avocados and nuts. Paleo is big in the Crossfit community (which I still subscribe to, but less ardently due to rotator cuff issues) and there is a ton of material and recipes throughout the web. I bought The Paleo Solution by Robb Wolf. The science is a little tedious — as it is in most diet books — but the concept is very simple. The primary secret to training diets is to log what one eats — obsessively — and to aid in that task I use the Livestrong “MyPlate” app for the iPad, using it as a calorie counter and goal tracker. My splits are dropping dramatically, especially for the benchmark 5,000 meter piece. No kidding-huge drop in split times in just 6 weeks. Just shows how quickly adaption can happen. I will take heart from your great example. I cannot wait for the before and after the Mime pics. Here’s some inspiration for you erging David from last weekend in NZ. There used to be another great video on YouTube of Tomkins and Ginn in the M2- sticking it to Pinsent & Cracknell in the 2003 World Championships but someone took it down. One of the best rows I’ve ever seen.